In Hebrew learning there are 6 levels of competence, very much reflecting the available research such as the Dreyfus and Dreyfus theory of “directed skill acquisition”. 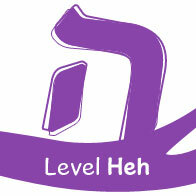 The levels range from the complete novice with no previous knowledge of Hebrew, to the competent speaker who feels at ease to communicate both in a verbal and written form. 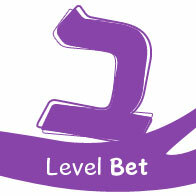 At Ulpan Aviv we understand the importance of aiming the course at just the right level in order to maximize results. A free evaluation is offered to all students in order to ascertain exactly what level each particular student is currently at, to identify any gaps in their knowledge and to design a program which will ‘fill in’ those gaps thus taking the students to the next level. Building a solid foundation in the Hebrew language is vital for each student’s progress in the years to come. No matter which is your Hebrew language level and orientation, you can attend a tailored and individual course in an online or face-to-face version. Contact us for more details or read more about our methodology. The Aleph student (beginner) can be described to a limited extent as a reader (beginner level). He or she can read slowly, but does not understand the content of what he or she is reading. 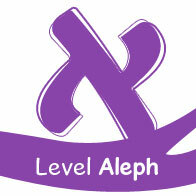 The vocabulary of the Aleph level student is very limited, comprising of only a small number of words. Usually these students can neither hold a simple conversation, nor do they have the confidence to speak. The Bet student (beginner+ level), is identified as being a more competent reader and as one who has a broad enough vocabulary to be able to hold a simple conversation. Usually these students have gaps in their knowledge of the Hebrew language and need for those gaps to be identified, and for support to be given in order to for them to be ‘filled in’. 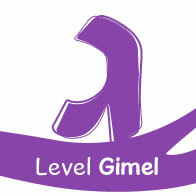 The Gimel student has already completed the first two beginner levels and has now arrived at the intermediate level. He now has a good passive knowledge of Hebrew and can understand a fair amount of things going on around him. The Gimel student now needs to transform all of his passive knowledge into active knowledge. 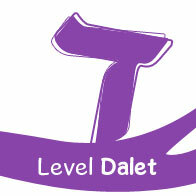 The Dalet level student is esteemed to be an advanced level student. He can conduct conversations and express himself more fluently using standard vocabulary. This category of student is able to talk about a range of issues even though his grammar will need further honing. Reading about current affairs in the newspaper (i.e. formal language), will still be challenging at this stage. This course is designed for the more fluent Hebrew speaker who wants to fine tune his or her Hebrew. The student studying at level Heh will be concentrating on more official written Hebrew as well as Hebrew used in other formal situations. Other elements included in this course include the introduction to many of the idioms and expressions that make up the Israeli language and a culture. 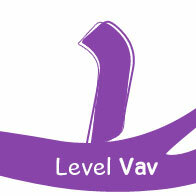 The level Vav student is able to use Hebrew freely, incorporating all of the language skills – comprehension, conversation, reading and writing. The natural evolution is therefore to progress on to the more complex written Hebrew structures used in Israeli literature, and the written language is precisely what is focused upon in level Vav.